Following last year's steak and fries-topped Bloomin' Onion, Outback goes with pork this year for the new 3-Point Rib Bloom. 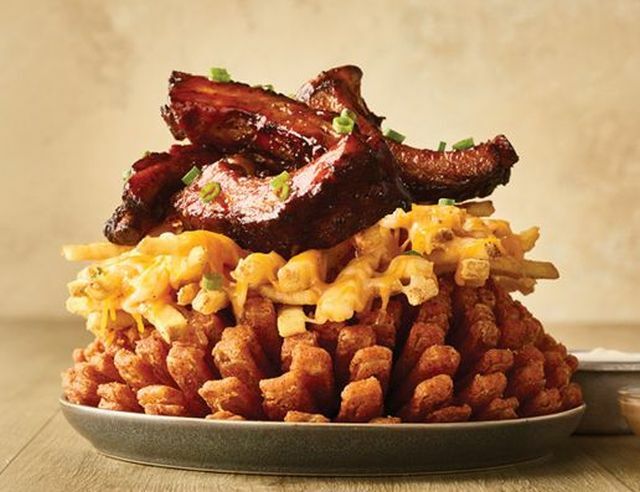 The new shareable menu item features the chain's signature Bloomin' Onion topped with Aussie Cheese Fries (French fries with Monterey Jack, Cheddar, and chopped bacon) and four baby back ribs brushed with barbecue sauce. The name of the dish refers to the three different layers but also plays on the 3-Point Rib Bloom's availability during at the same time as the NCAA Basketball Tournament (AKA March Madness).